I'm on step 7 of the assembly manual (v1.4). The guide says to slide the M3 square nut into the slot of the FT5 ACM, as far as I can tell there's no way that it fits. 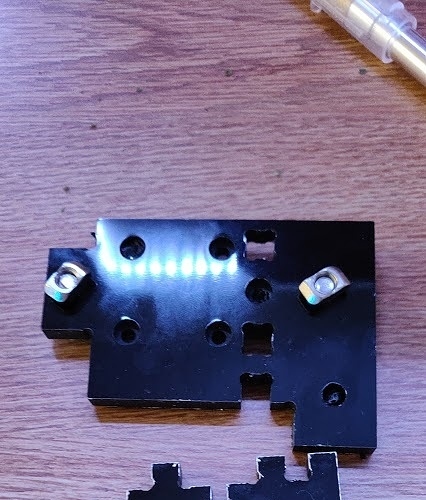 Am I looking at the wrong parts? 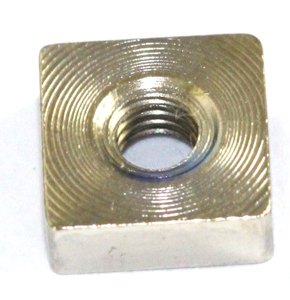 I can't find any other M3 square nuts in the kit, do I need to go buy M3 nuts to substitute? Um, that square nut is way oversized. Did that huge thing come in the kit? Yup, they gave me about 16 of those things. I wasn't sure if ACM was cut too small or the nuts they sent were too big, I guess its the latter. Do you have the outer dimensions of that nut? Unfortunately, all of my square nuts were oversized on my kit (completed last month). I used a file to open up the spaces. This was a little tricky because I had to file evenly on each side so that the hole was centered. Fortunately, it goes pretty quick with the right tools. I just talked to John about these. They were notified about the issue and are now checking them. Chinese supplier just don't get that different parts may not work the same. didnt you notice the 20% more on the bag of nuts?